At any given moment for the rest of our lifetimes, there will be multiple conflicts in mutating forms around the globe. Violent conflict will dominate the headlines, but cultural and economic struggles will be steadier and ultimately more decisive. To those ends, we will do a fair amount of killing. Destroying Iraq? For the past few decades, prior to the US invasion of Iraq in 2003, the percentage of the urban population living in slums in Iraq hovered just below 20%. Today, that has risen to 53% — 11 million of the 19 million total urban dwellers. In the past decade, most countries have made progress toward reducing slum dwellers. But Iraq has gone rapidly and dangerously in the opposite direction. According to the US Census of 2000, 80% of the 285 million people living in the US are urban dwellers. Those living in slums are well below 5%. If we translate the Iraqi statistic into the US context, 121 million people in the US would be living in slums. The US is spending hundreds of millions on airbases in Afghanistan that won't even open until (according to the Obama schedule) the war will be supposedly winding down. VP Biden said in a speech that the Obama administration is "following President Bush's proposal for a long-term relationship with Iraq." The primary nature of the US presence in the Middle East is the occupation of what now amounts to 2 colonies of the US. The use of the military will ebb and flow, and the administration's name for it will be adjusted with new deceits, but the reality is that America will remain the illegal occupiers of Iraq and Afghanistan. I bought a rather large book in a thrift store for $2 called The War in 2020, which turned out to be surprisingly entertaining. Though written in 1990, it was unusually prescient in some of the events it predicted for the years 2016 to 2020 — including that the US had elected its first black president, a man from the Chicago area. I looked the author up online — and discovered he is retired from a post with the US National War Academy, one Lieutenant Colonel Ralph Peters. Lt Col Peters was last posted to the Office of the Deputy Chief of Staff for Intelligence within the US Defence Department and has been one of the Pentagon’s foremost authors, with numerous essays on strategy for military journals and on US foreign policy. Further, I found a map Peters drew and published in the Armed Forces Journal in June 2006 — the map at left (left click once for larger version). This map has been circulating around strategic, governmental, NATO, policy and military circles and then causally surfaced in public. Is it an attempt to build consensus? To prepare the general public for massive changes coming in the Middle East? It won't be the first time that decisions are made about Middle-Eastern countries' boundaries based on reasons other than the good of the people who inhabit them. According to Peters: "International borders are never completely just. But the degree of injustice they inflict upon those whom frontiers force together or separate makes an enormous difference — often the difference between freedom and oppression, tolerance and atrocity, the rule of law and terrorism, or even peace and war. The most arbitrary and distorted borders in the world are in Africa and the Middle East. To borrow from Churchill, they generate more trouble than can be consumed locally." "Earlier this year, Lt Col Peters said Afghanistan is a waste of time and the US should go 'punitive' on the natives. Last month, he advocated killing 'partisan' journalists. He is a neocon’s neocon — to say nothing of a psychopath — and has no reluctance in speaking his mind when it comes to mass murder and engaging in crimes against humanity," says Turkish-American journalist, political commentator, and Columbia Law School graduate Cenk Uygur. In a segment with Fox’s Neil Cavuto, Peters says the "terrorists" now at Gitmo should have been slaughtered in the field. "Just like in the movies," says Peters, "monsters deserve to die." Cavuto reminds Peters that some of the detainees might be innocent, but Peters will have nothing of it. Sure, he says, there will be "miscarriages of justice" but we shouldn’t let that get in the way of killing Muslims. "We are better off killing known terrorists on the spot," he argues. A "dead terrorist poses a lot fewer legal problems down the road." In other words, kill ‘em all and let God sort ‘em out. "In interviews, dozens of high-level military, intelligence and law-enforcement officials in the US, Europe and the Middle East said that contrary to the repeated assertions of senior administration officials, none of the detainees at the US Naval Base at Guantánamo Bay ranked as leaders or senior operatives of al Qaeda," the New York Times reported on 21 June 2004. "They said only a relative handful — some put the number at about a dozen, others more than two dozen — were sworn al Qaeda members or other militants able to elucidate the organisation’s inner workings." Peters, by the way, is the author of the quotes at the top and bottom of this page. Peters said in 1995: "By the middle of the next century, if not before, the overarching mission of our military will be the preservation of our quality of life." He added in 1997: "Wise competitors will not even attempt to defeat us on our terms; rather, they will seek to shift the playing field away from military confrontations or turn to terrorism and non-traditional forms of assault on our national integrity. Only the foolish will fight fair." (And I guess he probably thinks the US isn't foolish, either.) As usual, he was ahead of his time. In the eyes of public opinion, possessing a "just cause" for waging war is central. A war is said to be Just if it is waged on moral, religious or ethical grounds. America's Crusade in Central Asia and the Middle East is no exception. The "war on terrorism" purports to defend the American Homeland and protect the "civilised world." It is upheld as a war of religion, a clash of civilisations, when in fact the main objective is to secure control and corporate ownership over the region's extensive oil wealth, while also imposing under the helm of the IMF and the World Bank (now under the leadership of Paul Wolfowitz), the privatization of State enterprises and the transfer of countries' economic assets into the hands of foreign capital. The Just War theory upholds war as a humanitarian operation. It serves to camouflage the real objectives, while providing a moral and principled image to invaders. In its contemporary version, it calls for military intervention on ethical and moral grounds against rogue states and Islamic terrorists which are threatening the Homeland. Possessing a just cause for waging war is central to the justification for invading and occupying both Afghanistan and Iraq. Taught in US military academies, a modern-day version of the Just War theory has been embodied into US military doctrine. The war on terrorism and the notion of pre-emption are predicated on the right to self defence. They define when it is permissible to wage war: jus ad bellum. Jus ad bellum serves to build a consensus within the Armed Forces command structures and to convince the troops that the enemy is evil and that they are fighting for a just cause. More generally, the Just War theory in its modern-day version is an integral part of war propaganda and media disinformation, applied to gain public support for a war agenda. The perpetual threat posed by a fabricated outside enemy and a militarized fearful populace remain the centrepieces of elite policy and they have been consistently maintained by both Bush/Cheney and Obama administrations. The demonisation of Muslims continues to facilitate pillage. Unfortunately, some of the pages on the site linked to in the above paragraph are far too extreme - for example: their Director, Michel Chossudovsky (Professor of Economics at the University of Ottawa), claims that the High Frequency Active Auroral Research Program (HAARP) is actually an operational weapon of mass destruction, with the power to alter the weather, disrupt regional electrical power systems, and modify the earth's magnetic field, as well as potentially trigger earthquakes and affect people's brains. Okay. Sure. But perhaps one last quote from Lt Col Peters will help put things into perspective: "The new century will bring new weapons, and some of those weapons will bring moral dilemmas. For example, suppose that discoveries in fields as seemingly diverse as evolutionary biology, neurology, complexity studies, advanced sonics, computerisation, and communications allow us to create a "broadcast weapon" that can permanently alter human behaviour without causing physical harm. We would immediately face protests from concerned parties to whom it would, paradoxically, be more humane to kill an enemy than to interfere with his or her free will." It seems as if war sends those on both sides over the edge mentally. (Or maybe HAARP did it. Since it's located up in Alaska, I can think of someone else whose brain it might've affected.) Peters and Chossudovsky seem mainly to disagree on interpretation and desirable outcomes, not facts. You can - and should - make up your own minds on the topics of what is moral, what is just, and what is necessary about the situation in the Middle East. The French trawler Bugaled Breizh sank mysteriously in the English Channel on 15 January 2004, a day before NATO forces started military exercises in the area. All 5 sailors aboard were killed. At first, military involvement in the incident was ruled out. However, sailors' families appealed in light of a research report which concluded that the ship may have been pulled under by a US submarine patrolling the area. Investigations are ongoing. A statement had been issued that it was likely that the vessel sank as a result of an accident with a nuclear attack submarine, though a specific submarine could not be identified as a number of submarines of several nations were in the vicinity of the accident site. As such, the relatives of the dead sailors and the owner of the ship received no compensation. The accident suggests that submarines operating in fishing zones represent a danger to fishing trawlers who, when "catching" a submarine in their nets, may be at significant risk of being pulled under. The Celtic League indicates that accidents with submarines may have accounted for the loss of more than 20 motorised fishing vessels since 1970 with the loss of over 150 sailors. They demand better communication between the military and the civilian authorities. About 2/3 of the findings published in the top medical journals are refuted within a few years. 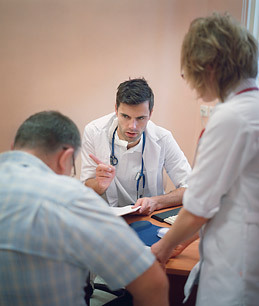 As much as 90% of physicians' medical knowledge has been found to be substantially or completely wrong. There is a 1 in 12 chance that a doctor's diagnosis will be so wrong that it causes the patient significant harm. In other fields, economists have found that all studies published in economics journals are likely to be wrong. Professionally prepared tax returns are more likely to contain significant errors than self-prepared returns. Half of all newspaper articles contain at least one factual error. Bad advice tends to be simplistic, definite, universal and certain. But, of course, that's the advice we most love to hear. Which Side of the Road? During the middle ages roads weren’t always safe for travellers; meeting people coming the other way on the road was best done defensively. Historians believe the "keep-left" rule was adopted because, on a horse, if you're right-handed and meet someone unsavoury on the road, you could draw your weapon (typically attached to your left side) with your right hand and bring it to bear quickly against the person who is going the opposite way on your right, all the while controlling reins with your left hand. If you meet a friend on the road, you can offer your right hand in greeting without needing to reach across your body on horseback. But in the US there was a switch in the 18th century to the left-hand side because there were men there who drove large wagons with a horse team. These wagons tended to dominate the road and in many of them, there was no driver's seat — rather, the driver typically sat on the rear left-most horse. Because most were right-handed, this allowed them to drive the team with a lash in their right hands. This then forced the issue of having oncoming traffic on the left as the drivers wanted to be sure no part of their team or wagon collided with the one coming toward them. 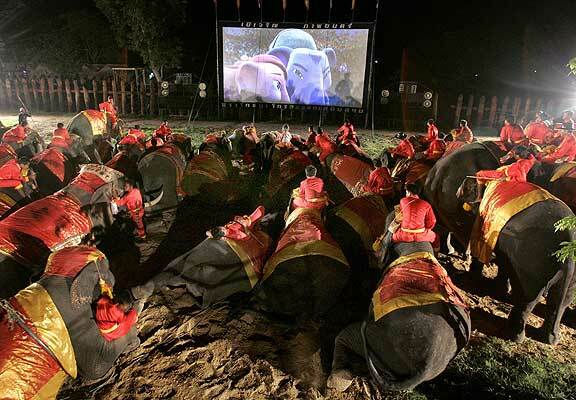 When sitting on the rear leftmost horse, this was easier when using a keep-right rule. Just as important, to pass a wagon in front, or even to just see further down the road when sitting on the left side, keeping right gives greater visibility of oncoming traffic. The person on the left is a female and no, she isn't dead. How old do you think she is? And why is she being photographed while she's sleeping? Terry Jo Duperrault is 11 years old in the photo. She has just been rescued after spending 4 days at sea drifting on a broken white cork raft. The captain of her family's rented sailboat killed her parents, her brother, and her sister in front of her. She dived overboard to escape and the captain merely sailed off and left her in the ocean. A Greek merchant vessel spotted her in waters off the Bahamas. This was in 1961. Helicopters had failed to see her because the piece of white cork she was using to stay afloat blended in with the whitecaps. Since that time, international regulations say life rafts should be bright orange. For the sake of argument, let's say you drink some antifreeze. The ingredient that makes antifreeze work is called ethylene glycol. When you ingest it, you can experience vomiting, severe diarrhœa, paranoia, dementia, and intense hallucinations. Eventually, glycol gets turned into calcium oxylate, forming small, needle-shaped crystals that shred your kidneys. Typically, this kills you. But if you call Poison Control, for the first time in your life you may hear legitimate medical advice that begins with "drink a few shots of vodka and drive yourself to the hospital." Ethanol will be digested preferentially by your body, passing the ethylene glycol out of your system in a life-saving stream of urine. The method is so reliable that it's a staple at hospitals. So why do they say, "...drive yourself to the hospital"? You're suicidal and now drunk, paranoid, and hallucinating. Perhaps if you're at the point in your life where you're drinking antifreeze, the assumption is that no one's around to do you any favours? What can you do to make your kids smarter? Keeping them healthy might help. A new study suggests that worldwide differences in intelligence can be explained by disparities in infectious disease. Researchers found that countries most heavily affected by infectious diseases generally have the lowest average IQs. They propose that these illnesses hinder children's brain development. Christopher Eppig, a Phd candidate in biology at the University of New Mexico, Albuquerque, and his colleagues propose that low IQ is tied to the toll of infectious diseases. Their idea, which they call the "parasite-stress hypothesis," is that children who contract parasites (which they define to include everything from intestinal worms to bacteria and viruses), devote more energy to fighting off infection. As a result, they have less energy available for brain development. Countries where infectious diseases are prevalent, they argue, will have lower intelligence. These conclusions are gathering mixed reviews. Maureen Black, a pædiatric psychologist at the University of Maryland School of Medicine in Baltimore, is sceptical, arguing that health by itself isn't enough for full brain development. "For children to develop intellectual skills, they need not only strong bodies and the absence of infections, they also need opportunities to explore and opportunities for enrichment." Those are scarce or lacking in poor countries. The Eastern grey tree squirrel, or Sciurus carolinensis, has been so spectacularly successful that it is often considered a pest. Yet researchers who study grey squirrels argue that their subject is far more compelling than most people realise, and that behind the squirrel’s success lies a phenomenal elasticity of body, brain and behaviour. Squirrels can leap a span 10 times the length of their bodies, roughly double what the best human long jumper can manage. They can rotate their ankles 180º, and so keep a grip while climbing no matter which way they’re facing. Squirrels can learn by watching others — cross-phyletically, if need be. A grey squirrel eager to traverse a busy avenue near the White House waited on the grass near a crosswalk until people began to cross the street, then it crossed behind them. In the acuity of their visual systems, the sensitivity and deftness with which they can manipulate objects, their sociability, chattiness and willingness to deceive, squirrels turn out to be surprisingly similar to primates. They nest communally as multigenerational, matrilineal clans, and, at the end of a hard day’s forage, they greet each other with mutual nuzzling of cheeks and lip glands that looks decidedly like kisses. Their tails serve as thermoregulatory devices, in winter helping to shunt warm blood toward their cores and in summer to wick excess heat off into the air. On 27 June 2006, a Boeing Delta 4 was launched from the SLC-6 ("Slick 6") launch pad at Vandenberg Air Force Base in Central California. "Slick 6" is famous for being the launch pad for the cancelled Manned Orbiting Laboratory and west coast Space Shuttle programmes. This first launch of the Delta 4 from the west coast carried a classified spy satellite for the National Reconnaissance Office, rumoured to be for eavesdropping. On 22 September 2005, a Minotaur rocket launched a classified satellite named "Streak" for the Defence Department. The Minotaur is a converted Minuteman 2 ICBM, with upper stage motors from a Pegasus rocket. Because the launch occurred after sunset, it took over a minute for the rocket to climb high enough to be in sunlight. High altitude winds quickly went to work, twisting the exhaust trail and forming ice crystals. The first 2 images were taken by astronomer Fred Bruenjes and he sells copies of some of his more spectacular photos on his website. Date Unknown, an example of noctilucent clouds formed from the contrail of another rocket launched from Vandenberg Air Force Base as viewed from a mountain ridge in Tucson, Arizona. By Bryan Johnson. Years ago, Jon Sarkin was a successful North Shore chiropractor living a normal life with his wife and child. Then came a stroke, surgery, progress, more challenges, and his emergence as an artist. Now, his work is being featured in the DeCordova Museum's prestigious Annual Exhibit. Sarkin's metamorphosis — from successful chiropractor to physically damaged, eccentric artist — is a remarkable transformation, a tale that has captured the attention of Hollywood. Tom Cruise's production company owns the rights to his life story and is developing a movie. Sarkin draws spliced Cubist forms inspired by Picasso. He splatters ink like gonzo master Ralph Steadman. He scribbles the names of his favourites: Dylan, Rothko, F Scott Fitzgerald. He also plays the merry prankster, adding flourishes — triple quote marks, a crop of capital A's, mock slogans — and laughs aloud as he imagines an art wonk trying to interpret the obscure markings. What does his art mean? "It really doesn't mean anything," Sarkin says. "If you want meaning, read The Wall Street Journal. My art is simply a diary of my experience." Diego Rivera, Mexico's best-known painter, once told Picasso, "I recommend her to you as an enthusiastic admirer of her work; acid and tender, hard as steel and delicate and fine as a butterfly's wing, lovable as a beautiful smile, and profound and cruel as the bitterness of life." He was describing his wife, Frida Kahlo de Rivera. Kahlo caught polio at the age of 6 but overcame it, eventually learning to dance and play sports. At 18, she was on a bus which struck a trolley. Her spinal column was broken in 3 places as were ribs, collarbone and pelvis; her right leg was broken in 11 places, her foot crushed and shoulder dislocated. An iron handrail pierced her abdomen. After the accident, she was bedridden for months and began to paint the plaster casts which held her in place. A special easel was created so she could paint lying down, and her mother placed a mirror on the ceiling over her bed. She mostly painted herself because that's what she saw. Although she recovered from her injuries and eventually regained her ability to walk, she was plagued by extreme pain for the remainder of her life. It often left her hospitalised or bedridden for months. She underwent as many as 35 operations, mainly on her back, her right leg, and foot. In 1953, her leg was amputated, a result of gangrene likely contracted during surgery. She died within a few months (a possible suicide). Rivera, whom she once divorced then remarried the following year, was constantly unfaithful. She retaliated by having affairs herself, including one with Leon Trotsky during his Mexican exile. She left a legacy of 143 paintings, though her addiction to pain medicine and alcohol caused a deterioration in quality near the end. Veijo Rönkkönen (born 1944, died this year), a paper mill worker, lived all his life on an isolated small farm in eastern Finland, Parikkala, less than a kilometre from the Russian border. There, he quietly built a garden inhabited by nearly 500 human figures made of concrete, including over 200 self-portraits in yoga positions (representing all the positions the near-hermit had tried). The artist never allowed his works to be exhibited, much less sold. On the few occasions he was asked to show his work, Rönkkönen always insisted on discussing the matter with the statues first — but they never wanted to travel. Entrance to his garden was free, though Veijo never talked to visitors voluntarily nor asked their opinion on his work. (He did request they write their names in his guestbook.) Despite his withdrawn character, Veijo always monitored the behaviour of his visitors. From indoors, he observed those walking in the garden and looked for anything out of the ordinary — when someone strayed into the flowerbeds, he would open the window and tell them to return to the path. Many of the statues have real human teeth — no word on where all those teeth came from. 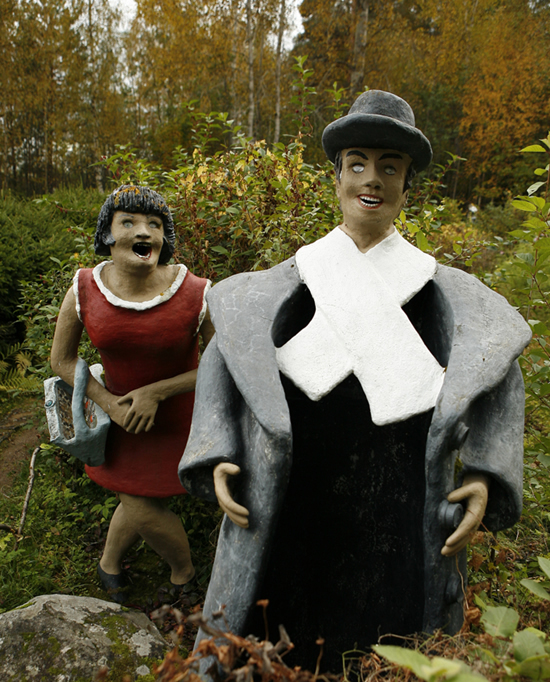 Veijo’s sculpture park can be seen as a reflection of his own life. The various parts and works express the stages of his life, from growing up with the dreams and fears that he experienced, to signs of ageing and maturity. The park is a portrayal of a personality, with its doubtful and conflicting characteristics. Now that he has died, the statues have begun to decay. Admirers of his works are trying to have his property turned into a park. If someone is rude to you at work or if you witness rudeness you are more likely to make mistakes. The link between rudeness and mistakes is particularly a concern in healthcare settings, where it can pose a threat to patient safety and quality of care. Research suggests that in confined areas such as operating theatres, even watching rudeness that occurs between colleagues might impair team members' thinking skills. In surgical environments, all staff require high levels of attention and memory for competent task execution. If incivility occurs and affects workers' ability to perform tasks, the risks for surgical patients — whose treatment depends on particularly high levels of mental concentration and flawless task execution — could increase. Rudeness at work is not uncommon. In one survey, 66% of respondents said they had "received aggressive behaviour" during the previous 6 months. Civility between workers may have more benefits than just a harmonious atmosphere. ("Please hold. Thank you for holding. We are sorry you are having to hold. We are sorry to say please. Excuse us for saying sorry. We are sorry to say thank you. Sorry, please, thank you. Thank you, sorry, please.") Can we also be too polite? Rudeness (also called impudence or effrontery) is the disrespect and failure to behave within the context of a society or a group of people's social laws or etiquette. These laws have already unspokenly been established as the essential boundaries of normally accepted behaviour. To be unable or unwilling to align one's behaviour with these laws known to the general population of what is socially acceptable is to be rude. Rude behaviour among employees can negatively affect consumer perceptions — even when the incivility isn't directed at the customer. Across a range of industries, including restaurants, banks, government offices, retail stores and universities, consumers frequently report seeing employees behaving badly toward other employees, including derogatory comments or inappropriate gestures. These findings underscore the need for organisations to promote employee civility. People witnessing employee incivility were faster to jump to negative conclusions about the company than those who witnessed employee incompetence. Customers turned against the company even in instances when the rude employee was trying to help the customer. In one of the studies, people who had to wait several minutes as an employee gossiped on the phone still formed negative impressions of the company when the employee was reprimanded rudely by another employee in front of them. That Water Must Be at Least 90º! Dad! Come and see these cute kittens we found! Electric cars are all well and good, and Nissan’s upcoming Leaf will surely sell, but with their constant need for recharges, and a current lack of locations to supply them, ecology could seriously curtail convenience. However, by considerably reducing the size of the car, battery usage can be substantially shrunk. This minuscule little motor is rumoured to be able to carry one person around town on only a couple of AA batteries. The MC-1EV is Mitsuoka's environmental alternative. 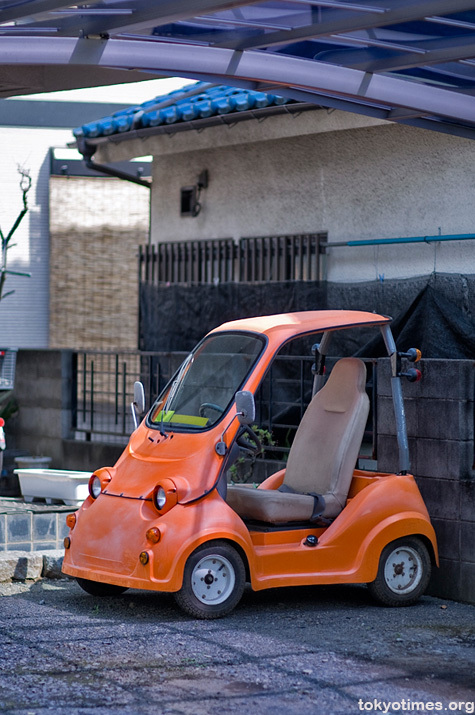 A microcar for one person, the MC-1EV is a battery-powered electric car that can be recharged at home in 8 to 12 hours. One charge will last for up to 50 kilometres. There are lots of 1-person cars on the market now, most better looking than this, most costing $20,000 to $35,000. This car? $5,800. But if you're only going around town and not transporting anything too heavy, why not just walk? That's even cheaper. A series of studies published in the Journal of Personality and Social Psychology found that people who were asked whether they would die for their faith or support their country by going to war in its defence were more likely to say yes when they were in anxiety-provoking situations. Scientists also found that religious zeal was most pronounced among people who were already vulnerable to anxiety and who felt hopeless about achieving their goals in daily life. A psychological phenomenon called reactive approach motivation is behind the findings. Approach motivation is a tenacious state in which people become "locked and loaded" on whatever goal or ideal they are promoting. 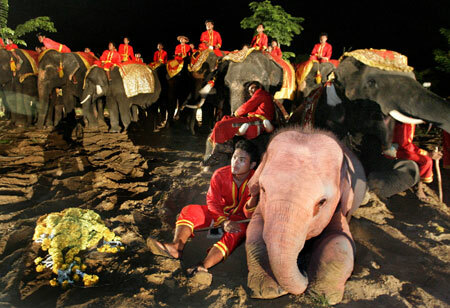 They feel powerful, and thoughts and feelings related to other issues recede. Strong religious beliefs are associated with low activity in the anterior cingulate cortex, the part of the brain that controls anxiety. The results of this research suggest that bold but vulnerable people gravitate to idealistic and religious extremes for relief from anxiety. The photo is of Shia Muslims practicing self-flagellation. 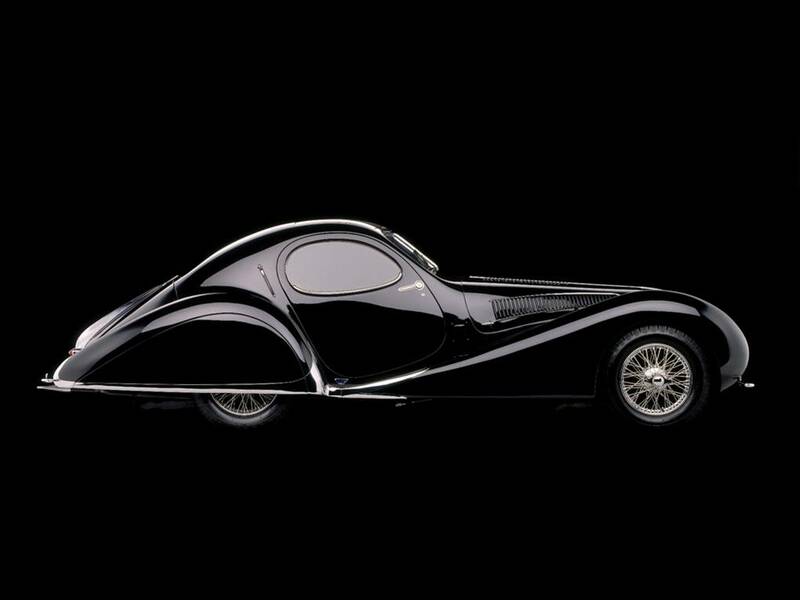 Car 1 — Talbot-Lago T150 C Figoni et Falaschi "Goutte d'Eau" 4-litre 6-cylinder in-line engine. Only 16 units built; valued at US$3 million. 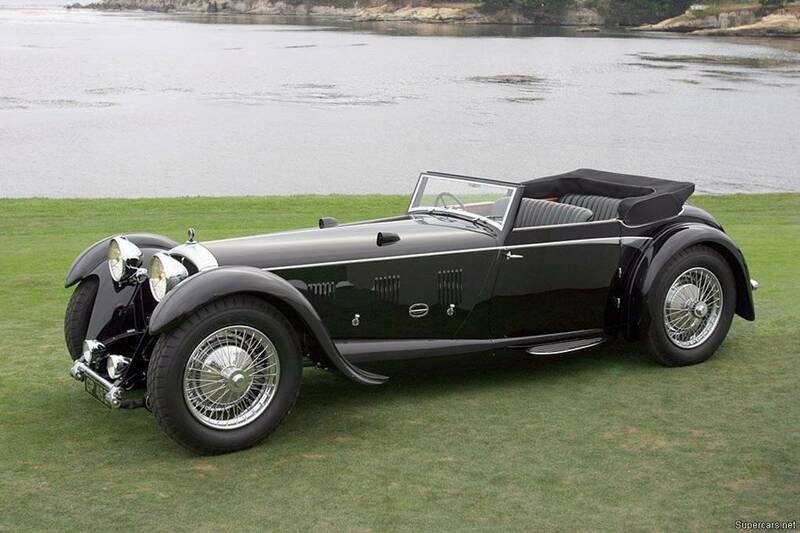 Car 2 — Mercedes-Benz 710 SSK Trossi Roadster in-line 7.1-litre 6-cylinder, unique, built in 1931. Won the concours d’élégance of Villa d'Este en 2007. Car 3 — Daimler Double-Six 50 Corsica Drophead Coupé 7.2-litre V12 engine. Unique car, built in 1931. Of 280 healthy research subjects in Japan, half were instructed to walk through a forest or wooded area for a few hours, while the rest walked through a city area. On the second day, they traded places. Scientists discovered that being among plants produces "lower concentrations of cortisol, lower pulse rate, and lower blood pressure," among other things. (It takes a graduate degree to prove that a walk among trees is better than walking on cement and breathing car exhaust.) A number of other studies have shown that visiting parks and forests raises levels of white blood cells. Men who took 2-hour walks in a forest over 2 days had a 50% spike in levels of natural killer cells. Another study found an increase in white blood cells that lasted a week in women exposed to phytoncides in forest air. What they don't say — that I can't help but wonder about — is how important the walking bit is. Can you sit under a tree and read for 2 hours and get a positive benefit? Fall asleep in a greenhouse? What if the park lawns have recently been sprayed with pesticides? Must the walk occur in the spring or summer, or do trees with yellowed or missing leaves still provide benefit? Does there need to be a certain amount of wildlife encountered (butterflies, birds, the odd squirrel or raccoon)? Does having your dog(s) with you add any benefit? Why fund such an incomplete study that merely definitively shows what common sense tells you anyway? 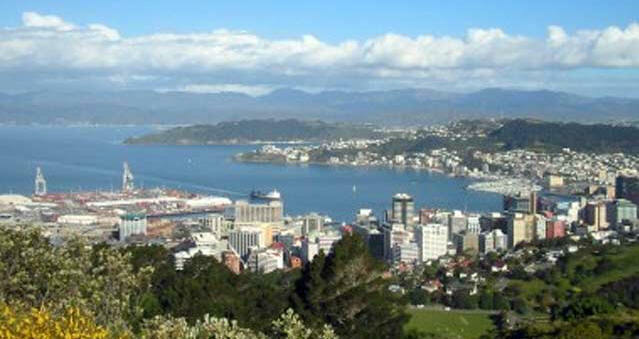 The photo is of Mt Victoria, a 10-minute walk from our door. In the last week of May, a nondescript white boxy structure appeared on Amsterdam's Oosterdokskade, in front of the central public library. Open and free to the public for a duration of 4 weeks, the box hid a unique realm. Called the Unlimited Urban Woods because the interior space seemed to be an infinite pocket of nature. Opposing mirrors enclosed a single pollarded linden tree; within the box, it seemed as if the observer stood not in a city, but in an endless forest. Sydney, Australia has something similar called Infinity Forest; I think I like it better. It has more trees and the box is left open to the sun; you can look up and see the skyscrapers, which I think might make me appreciate the respite even more. This wasn't my dad, but John Van Vliet's. The transition between these two photos was very carefully and expertly done. "My father had been stationed in Germany for a number of years when this picture was taken in 1952. I took him back there in 2006 and we found the original location where I photographed him from the same position of the original photo. The two images were composited together to show the transition of time." Better to Be Lucky (right) is a YouTube compilation of lucky moves and escapes (at least some of which you'll have seen elsewhere). 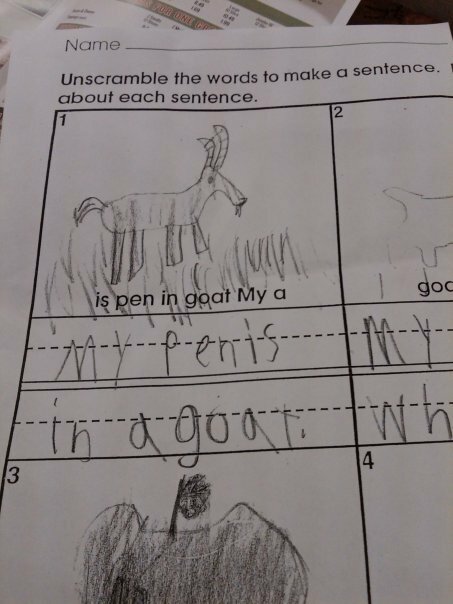 Correct answer: "My goat is in a pen." Via Tywkiwdbi. Look Down — look at the feet of the people around you, not directly forward. Your "personal zone" is roughly a 6-foot radius. Fewer than 6 people in your zone and you can walk normally. If there are 10 or more people in your zone, look almost straight down, as you will need to tack and spurt, slowing down and speeding up as you go. Avoid eye contact. And don't apologise. Don't be rude, just keep moving forward. Employ "The Shark Fin" — use a simple directional signal: bring one hand up, close to your chest, just below eye level; point your fingers in front of you, shaping your hand like a paddle. As you move, you can use this to indicate where you're heading — when people see it, they'll understand that you're on the move and you aren't trying to simply squeeze in front of them and block their view. More often than not, they will let you slip by. This also serves as a cue for folks to move their beverage of choice safely out of your path. Inside the main house, the left side of the lit proscenium is visible along with some of the east side private boxes (now beginning to fill with the rich and [in]famous). This show is being brought to you by Thaumaturgy Ltd, which is located in beautiful downtown Wellington, New Zealand. and the enemy dead do not have names, faces, and families. while killing and wounding tens of thousands more in less dramatic fashion. and bore little or no direct responsibility for Iraqi excesses in Kuwait City. We killed those who did not have the courage to desert. Yet killing them in their thousands was "legitimate" and untroubling. But try slapping one prisoner on CNN!